The Blurb: ‘This is the ultimate, easy-to-read guide for “eclipse-chasers” which includes everything an eclipse chaser needs. There are some important eclipses coming up in the years ahead and the technology available to amateur astronomers is improving fast. The book provides “eclipse virgins” with a good feeling for what a trip abroad to an eclipse is like — including a humorous look at all the things that can and have gone wrong. Travel details are included, essential in these days of high-security. 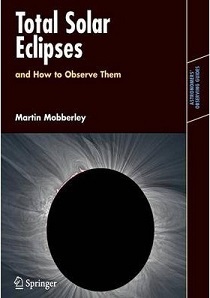 And of course the first part of the book contains a wealth of information about solar eclipses and what can be observed only during a total eclipse. You have to get right the first time, which is where Total Solar Solar Eclipses and How to Observe Them comes in. Here is all the information an eclipse chaser needs to ensure a trouble free expedition. Martin Mobberley explains how to avoid equipment and set-up errors thousand of miles from home, advises on the right equipment to buy for observing and digital SLR imaging, and explains the crucial points to address when traveling abroad with astronomical equipment.